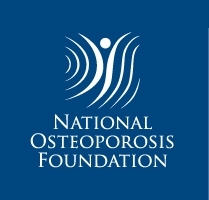 An innovative, non-ionizing technique to diagnose osteoporosis on lumbar spine and femoral neck was evaluated through a multicenter study involving 1914 women. 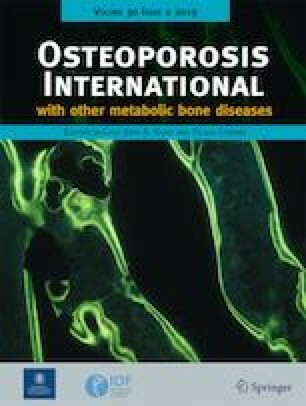 The proposed method showed significant agreement with reference gold standard method and, therefore, a potential for early osteoporosis diagnoses and possibly improved patient management. 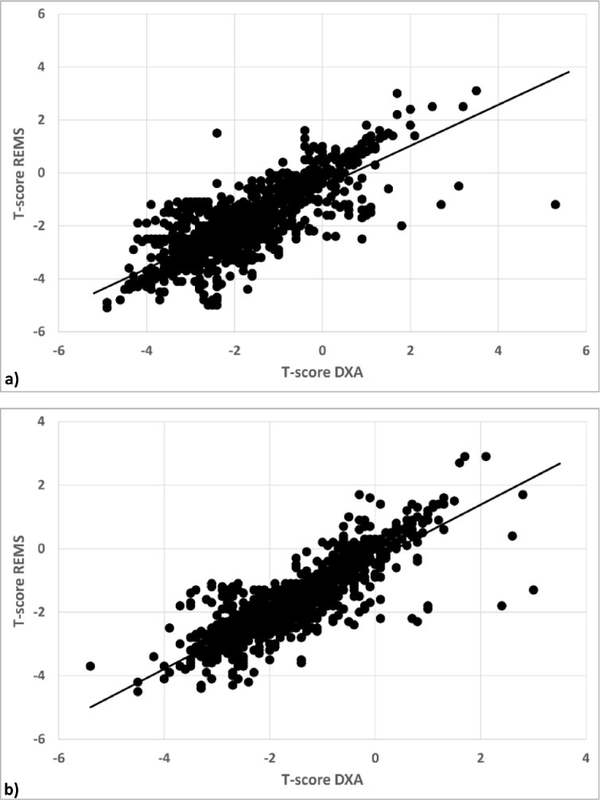 To assess precision (i.e., short term intra-operator precision) and diagnostic accuracy of an innovative non-ionizing technique, REMS (Radiofrequency Echographic Multi Spectrometry), in comparison with the clinical gold standard reference DXA (dual X-ray absorptiometry), through an observational multicenter clinical study. In a multicenter cross-sectional observational study, a total of 1914 postmenopausal women (51–70 years) underwent spinal (n = 1553) and/or femoral (n = 1637) DXA, according to their medical prescription, and echographic scan of the same anatomical sites performed with the REMS approach. All the medical reports (DXA and REMS) were carefully checked to identify possible errors that could have caused inaccurate measurements: erroneous REMS reports were excluded, whereas erroneous DXA reports were re-analyzed where possible and otherwise excluded before assessing REMS accuracy. REMS precision was independently assessed. In the spinal group, quality assessment on medical reports produced the exclusion of 280 patients because of REMS errors and 78 patients because of DXA errors, whereas 296 DXA reports were re-analyzed and corrected. Analogously, in the femoral group there were 205 exclusions for REMS errors, 59 exclusions for DXA errors, and 217 re-analyzed DXA reports. 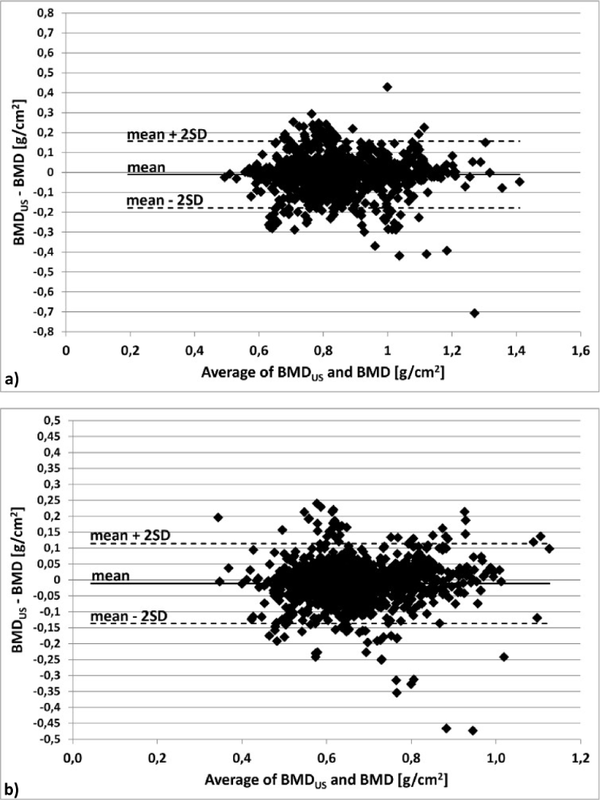 In the resulting dataset (n = 1195 for spine, n = 1373 for femur) REMS outcome showed a good agreement with DXA: the average difference in bone mineral density (BMD, bias ± 2SD) was −0.004 ± 0.088 g/cm2 for spine and − 0.006 ± 0.076 g/cm2 for femur. Linear regression showed also that the two methods were well correlated: standard error of the estimate (SEE) was 5.3% for spine and 5.8% for femur. REMS precision, expressed as RMS-CV, was 0.38% for spine and 0.32% for femur. The REMS approach can be used for non-ionizing osteoporosis diagnosis directly on lumbar spine and femoral neck with a good level of accuracy and precision. However, a more rigorous operator training is needed to limit the erroneous acquisitions and to ensure the full clinical practicability. The online version of this article ( https://doi.org/10.1007/s00198-018-4686-3) contains supplementary material, which is available to authorized users. The authors thank Carla Signorini for her help and assistance in performing the DXA scans. Marco Di Paola, Davide Gatti, Ombretta Viapiana, Luisella Cianferotti, Loredana Cavalli, Carla Caffarelli, Eugenio Quarta, Paola Pisani, Giuseppe Girasole, Andrea Giusti, Monica Manfredini, Giovanni Arioli, Marco Matucci Cerinic, Gerolamo Bianchi, Ranuccio Nuti, Stefano Gonnelli, Maria Luisa Brandi, Maurizio Muratore, and Maurizio Rossini have no conflicts of interests. Francesco Conversano owns stocks of Echolight Spa.